Every time we go to the pool or the water park we lug 3-4 giant bags full of towels, snacks, clothes, blankets, you know the deal. But I want just one bag. 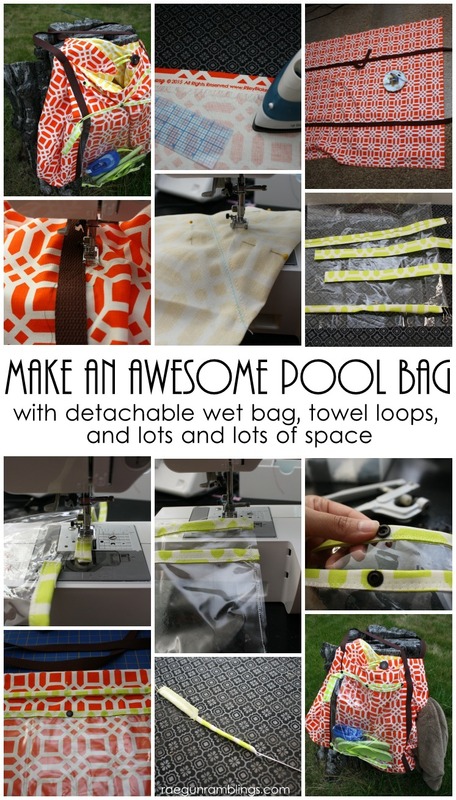 So today I’m sharing the biggest most awesome pool bag tutorial with all the features I wanted. It’s huge. Like bigger than an IKEA bag huge. And there are no interior pockets since I expect we’ll throw other bags in but you can easily tweak this tutorial to add pockets if you want! 1. Start by folding the selvage edges of your outside fabric and lining fabrics under 1 inch and iron. This will be the top of your bag pieces. 2. Next sew the belting to the outside fabric to form the straps. If you want to make loops to hang towels on mark your bag on one side 6 inches down and then another 9 inches down from that on both straps. You will not sew between these points so that you can leave the opening. At every end point make sure to reinforce your stitches. I stitched a little box with an X at each end and before the towel spaces so that those points were extra strong. I simply overlapped the ends at the center (which will become the bottom of the bag) and then did a bunch of zig zags over the raw edge to tack it down. 3. Next fold your lining piece right sides together and mark a sewing line across each bottom corner 7 inches up and 7 inches across. Sew across these lines. Do the same for your outside fabric. 4. On your lining piece still with right sides together sew up the sides I actually did two rows of stitches to make that seam extra strong. Repeat for the outer fabric part. 5. 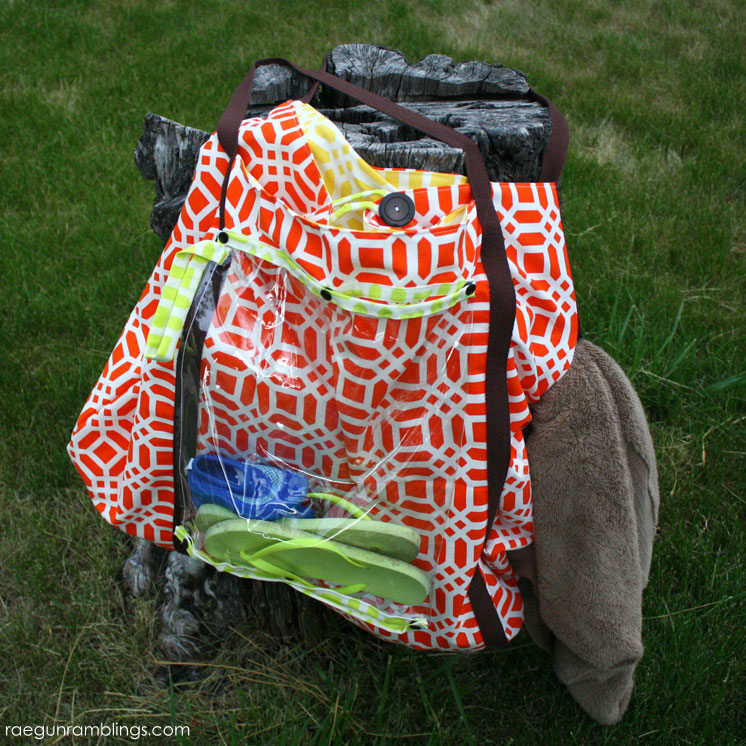 Set those pieces aside and make your wet bag. 6. 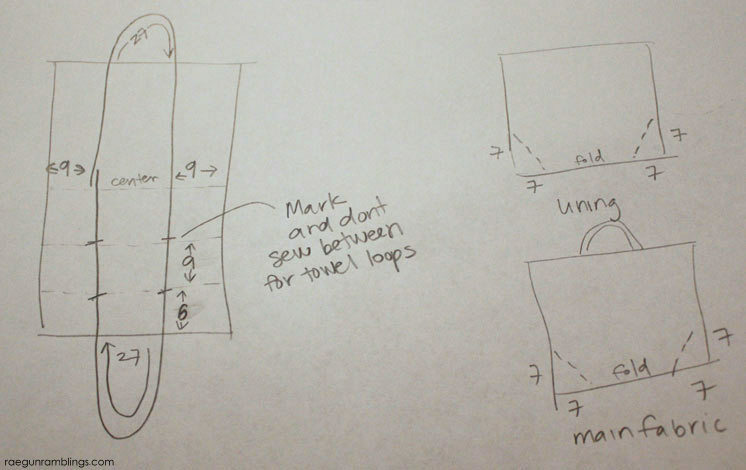 Start by making “bias” tape with your scraps. The fabric does not need to be cut on the bias. But you run your strip through a bias tape maker or simply iron both edges towards the center of the strip wrong sides together. 7. Cut your vinyl so that your piece resembles the image. 8. Cut your bias tape to 13 inches long. 9. Tuck the ends under about 1/2 inch and sandwich the 15 inch edge with a strip of bias tape. Zig Zag the fabric onto the vinyl. 10. Repeat with the 16 inch side. 11. 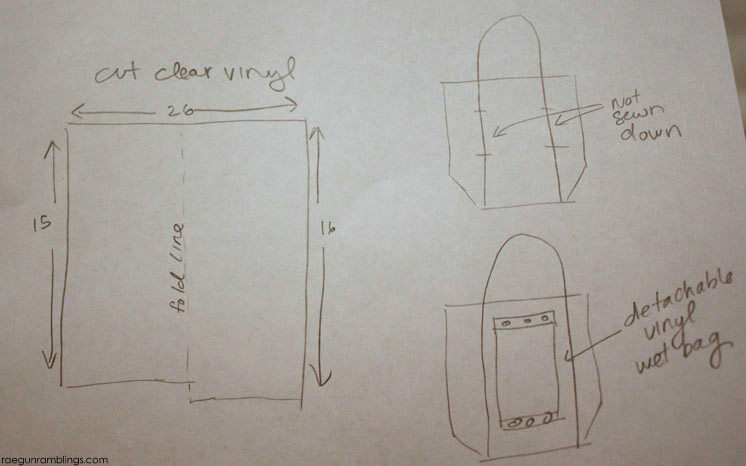 Fold in half so your vinyl is a double layer 13X 15/16 inches. Sew down the long edge. 12. Sandwich the top edge with a 3rd piece of bias tape and zig zag on remembering to tuck the edges under. 13. Tuck the ends under and fold the remaining bias tape in half and sew to the side of your bag where the straps are full sewn down (so NOT the side where you left towel openings). 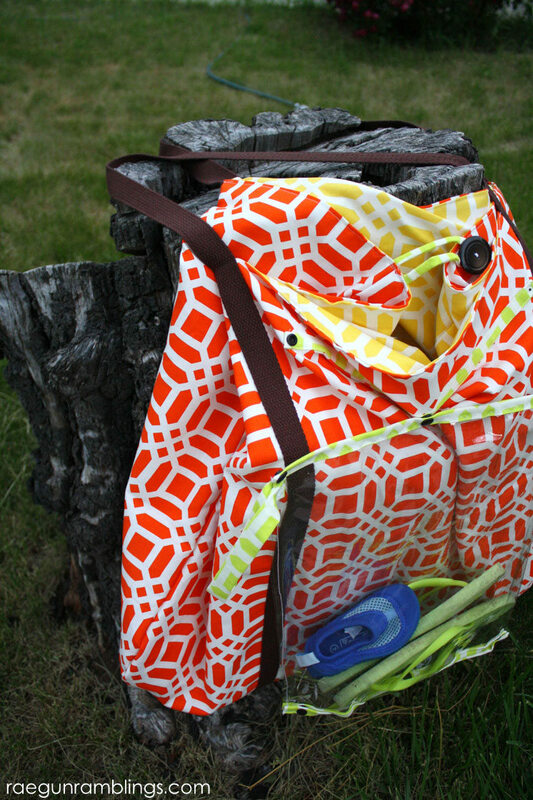 14.I decided at the last minute to add a strap to the wet bag. To do this cut a strip 2 x 10 inches long make a tube, turn it right side out and attach it to the wet bag. 15. 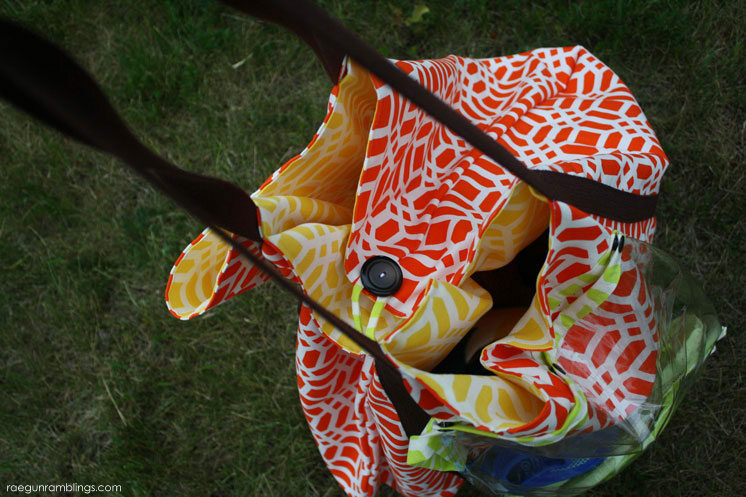 Add snaps to the strip on the bag, the top strip on the wet bag and the opening edges on the wet bag. If you prefer to use velcro you might want to make your bias tape pieces thicker. 16. Make a button loop by sewing your 1×4 inch piece in half lengthwise with right sides together. Turn right side out and fold in half. 17. Now slide the lining into the outer bag piece with wrong sides together catching the button loop you just made between the two layers. Remember your edges are already ironed under so you just need to stitch around making sure to catch all the layers. 18. Lastly sew your button onto the oppose seam of the button loop. This took me about 3 hours for me to make so not crazy speedy but not too long either. It’s really really really HUGE. 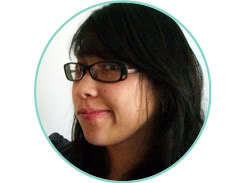 And I love that but if you don’t you can easy tweak the sizing. I drew it out on paper first and that helped me. I used the super gorgeous Patty Young Vivid Lattice Home Decor fabric from Riley Blake in Tangerine, Marigold, and Lime. 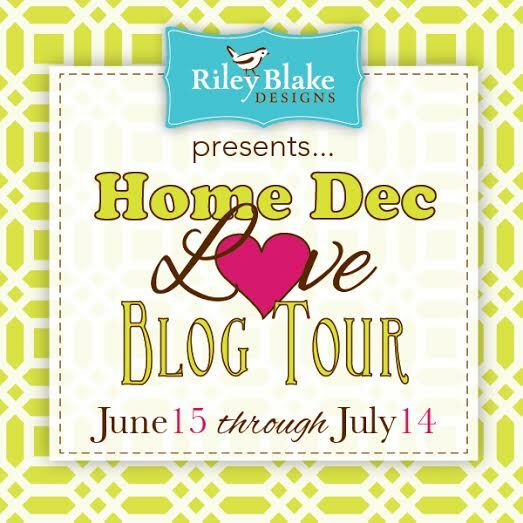 I’m so excited to be joining in the Home Decor Fabric Tour with Riley Blake. I can’t wait to see all the different projects that the rest of the bloggers came up with! Check them out. Awesome bag! 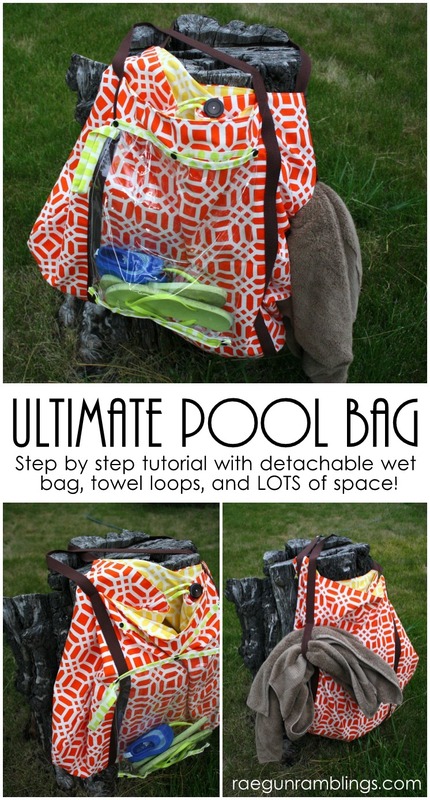 I especially love the detachable wet-bag. Thanks for sharing. Thanks so much I’ve used it a bunch now and that part is SO useful!